The Lawsuits hail from Doylestown Bucks County, Pennsylvania. It is home to the Moravian Pottery and Tile Works, and affords one the chance to pursue interests in farms, vineyards and tree farms. It is a place with a heritage very much of the earth. But, on Darleen, it is the cope of starry heavens to which the band turns its sights. Darleen is astronomical. On “Shooting Star,” in a timbre evocative of Bessie Smith, singer Vanessa Winters testifies: “I”ll never fall in love again.” On this early track and throughout, an absent lover still shines in secret, and the blues and gospel instrumentation connect the songs to a past, emotionally as well as musically. On “I’m Still in Love with You,” songcraft equal to Bob Dylan’s accompanies lyrics in rapture to a lost love: “Like the rays of sun are hot/ Or how the sunshine is bright/ Never once have I stopped loving you.” The light from the lover has gone, and the singer burns, but in the dark. In “You”re a Star,” musical craft reminiscent of country writers like Joe “Red” Hayes illuminate vocals lamenting a lover whose attractive force holds the singer in orbit long after the last of their light has gone. All through this collection, opposites and ambiguity abound: night and day, hot and cold, past and present. A listener’s ability to reconcile tensions is complicated by a strange but compelling lyric in “Beautiful Anger”; it is a moment which encapsulates the tension recurrent throughout. The vocals of Winters and Brian Dale Allen Strouse are simultaneous yet separate, and their respective harmonies coincide in separation, paralleling lyrics and music at once sad and happy. Ambivalence in lyrical oxymora, as Strouse urges: “So, let’s be alone together/ Let’s swim in depression all day.” “Alone together,” impossibly one without the other — in solitude, these words seem to remember togetherness. In tears or tides, to “swim in depression” liquefies sadness. To this absent someone, Strouse sings, “You’re quite important like the moon.” The comparison here implies that, just as without the moon, controller of tides, the lover’s absence is chaotic. Water and sea are recurrent interests on this collection. This is fitting for songs which conceal their full depths until you are in them. And you are in them, for they explore loss experienced by everyone. Not only do you recognise a reverent homage to musical legacies, but to your own memories, as well. “I’m just a sailor on the bottom of the ocean,” concedes Strouse as the nautical metaphor continues in “Sailor.” “I think it’s strange how you can love someone / And once pretend/ Not to know that they exist.” Like the lightless star, Darleen as the sea takes you beneath without trace only to restore the seamlessness of her surface. Lyrically, The Lawsuits appeal by enjoining your interpretation on this track. Cryptically, Strouse sings, “My eyes see more as I see less.” Indeed, there is more to see than the brilliance of the imagery, and it is witnessed during the guitar solo which provides one of the most beautifully emotive moments on the album. From 2:37 to 2:44, sheer soulfulness touches upon the anguish so elusive throughout. It should not go unnoticed that deep beneath the strength of these moments is Brendan Michael’s bass, and the percussion of Josh Aaron and Mylo, whose collective musicianship is the pulse, the current. The focus here on certain tracks is not due to a lack in the others, but instead because they exhibit the sounds and issues felt throughout — that love is not some soft and gentle thing, but a feeling which burns, scorches, freezes and drenches; it can take you to great heights or out of your depth. The legacies and histories of blues, country and gospel, along with their soulfulness, regret and optimism, befit The Lawsuits’ struggles with the past. Their “sound” takes what survives over time without ever relinquishing the urgency of what is affecting them now. Comparisons are unnecessary, for they could lead anywhere from Bob Dylan to Band Of Horses. Suffice to say that in its own right this album shines. 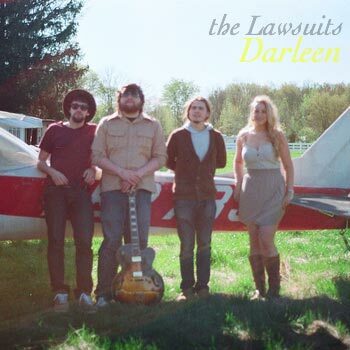 Like Darleen the former love, Darleen the album will become part of a history faithfully recalled. After countless impassioned listens, Darleen remains darker in the sky, and traceless in the tides, elusive above and beneath listeners. Yet, herein is the record’s excellence; it turns sorrow into solace, and leaves you glad to have found music so attuned to loss. At the end of “Sailor,” a modulated voice poses the question, “When you hear the word love, do you feel anything?” For the confusion felt in love, for the ways you have tried to see through, for all that you seek to guide you thereof, Darleen may be the answer.